When Matt first came to me and said he wanted to share a testimony about being hospitalized recently due to suicidality, I was honored and also worried. I was honored by his willingness to be vulnerable and his recognition that there can be a holy, transformative power in chosen vulnerability shared within a faith community. I also felt protective of Matt, concerned that we could receive his story as the gift that it is when we haven’t collectively done our homework at Lyndale around mental illness and understanding suicide. I also felt protective of all of those of us who have struggled with suicidality or had people we were close to who struggled. I personally have multiple “successful” suicides on both sides of my family across multiple generations. This is deeply painful stuff and triggering stuff. So I want to be sure you remember that if at any time you just need to get up and take a break from this sermon, that’s really ok. Fred Kuhnen is sitting in the back happy to step out with you and just listen or you can just step out and breathe by yourself. Nobody will be offended. In fact, we’ll be proud of you for taking care of yourself. In addition, there is SO MUCH abusive theologizing about suicide that has come from the church. That’s ultimately why I decided to say yes to Matt. I decided to trust the Spirit moving through Matt and that this community has held each other through enough that we can hold him well today as we hold each other. I will also be available after church for support. Finally, our Gospel, the Gospel of Mark, offers us a gift of a container for talking about this kind of pain and loss and trauma. A little context on the Gospel of Mark: Mark wrote this Gospel in the period of reckoning after the Jewish-Roman War that destroyed the center of Jewish worship, community and economic life – the temple – in about 70CE. This was a time of daily crucifixitions by Rome of hundreds of people, systemic decimation of Israel’s religio-political leadership, and a total reconfiguring of the people of Israel’s individual and collective sense of self. Mark is not shy about this trauma of living in Empire times. And because of that, he is an excellent companion for us in our own version of Empire times and the reverberations of trauma we are all feeling whether or not we have the language for it. That’s why one of the preaching companion books I’m using for this Mark series is a book called Re-Reading the Gospel of Mark Amidst Loss and Trauma, by my friends and mentors Revs. Drs. Maia Kotrosis and Hal Taussig. The thinking and language of trauma theory can help us recognize good news when it is fragile and hard to find in these times. Kotrosis and Haussig claim, “[The Gospel of Mark] is not just an account of destruction and trauma. It is also an account of traumatic survival in that loss. It [offers the reader] a space for mourning and contemplating loss, as well as for assembling something new, if only tentatively and temporarily. It offers moments of relief, possibility, and beauty amidst ruin.”  This is the Gospel, the “good news,” of Mark – that “reparative moments appear in the middle of violence and defeat.” This so-called “repair” is “never final or perfect… [but] carries… brokenness inside of it.” Mark doesn’t “resolve, redeem, or justify” the brokenness. Instead, Mark reminds us just how intermingled it is with our healing. Like Mark’s story of Jesus, Matt’s story of living with mental illness and on the brink of suicide is an account of survival in the middle of pain that holds all the reverberations of our times too. It is another story of good news – of relief, possibility and beauty – that is also tentative and fragile. Matt’s story isn’t about triumph or cure, but about finding a kind of remission inside of which there is healing intermingled with pain. The key ingredient of this kind of real healing is trust, according to the Gospel of Mark. Unlike the other Gospels, the healing stories of Mark’s Gospel are not about demonstrating Jesus’ power but about the “trust” of those he heals shown in their willingness to break isolation – whether by receiving Jesus’ presence in their home or seeking Jesus out in the streets. It’s this stepping out of isolation and into trust, that allows them to find healing personally and communally. Matt has been stepping out of isolation, out of separation, so courageously and continuously recently. This moment of sharing his story with us is yet another example. And yet, as Taussig and Kotrosis put it, trust “simply cannot be without a large measure of vulnerability, and is therefore itself an openness to the possibility of more pain and loss.” Trust and its companion of healing is always a scary endeavor. So let us receive Matt now with the same bravery with which he steps into the pulpit. Let us remember that this is his story, and his story alone. It is not a prescriptive theology of mental illness or suicide, but a descriptive experience of Matt’s story and process of meaning -making that may offer us each a glimpse of our own lives in new light. Let us now welcome Matt. And as you listen, I invite you to listen for the child Jesus welcomes in our scripture who represents all that is sacred and all that is most vulnerable in his society. This is not about some cheesy invitation to pay attention to your inner child. Instead, it is an invitation to take seriously what it would mean to welcome what is just beginning, what is unfinished, what is tenderly dependent and sometimes scared inside yourself as an act of welcoming God into your midst. Hello, my name is Matt Borneman and I’m a gay man. Hello, my name is Matt Borneman and I’m a gay man who suffers from Major Depression. Hello, my name is Matt Borneman and I’m a gay man who suffers from Major Depression and Generalized Anxiety Disorder. Hello, my name is Matt Borneman and I’m a gay man who suffers from Major Depression, Generalized Anxiety Disorder and symptoms of Borderline Personality Disorder. Hello, my name is Matt Borneman and I’m a gay man who suffers from Major Depression, Generalized Anxiety Disorder, symptoms of Borderline Personality Disorder and self hatred over my sexuality. So I need a show of hands: how many of you believe Hell actually exists? Okay, now how many of you believe that The Devil and demons are real? Well, my Lyndale friends and family I am here to tell you that Hell does indeed exist, for I have been there, and The Devil is very real because I’ve looked him straight in the eye and lived to tell about it. Hell is red, crimson red in fact, I’ve had those crimson red flames lick my skin. Hell feels much like a jail, you have no privacy in Hell, there are no trees or birds, there is no fresh air, just musty hot sulfur. In hell, time does not exist, for you have no control of it. And those demons I speak of? They are with you all the time, hanging off you and trying to pull you further into darkness. Now the Devil, he lurks in the shadows trying to snuff out any light you cling to. And The Devil loves to come especially at night! That’s when he will get inches from your face or breath down the back of your neck, and no matter how hard you try there is nowhere to run from him, because in hell The Devil has latched onto your soul. Yes, my friends this hell exists, but sometimes it is a necessary hell. You see the hell I speak of isn’t somewhere deep underground, but on Station 10 of the Psych unit at Fairview Riverside Hospital. The flames of Hell are the crimson scrubs that they make you wear. Hell is having all of your personal freedoms stripped away from you, from all your personal belongings, including your clothes, to your own privacy, and even your personal time. Hell is being on a 250 foot locked unit, where your room feels like a prison cell. You literally have no where to go. And those demons I speak of? They are the demons of my mind, they are the demons of mental illness that have plagued me for most of my life. And The Devil himself? Well, he is the shadowy shell of a suicidal man who stared back at me every time I looked in the mirror during my 15 day stay at Fairview. The Devil is the reason I’ve been hospitalized 6 times since I was a teenager, The Devil is suicide itself! If God is light and love, and God helped create this light/MY Life, what else can describe the pain, the twisting of my own thoughts, the twisting of my emotions until I’m driven to wanting to end my life other than The Devil? What other word can describe the hate I have for myself because I’m a gay man other than The Devil that is inside of me? How else can I describe feeling suicidal other than The Devil trying to snuff out the life a loving God helped give me?! When people ask me what its like to live with multiple mental illnesses, the only way I know how to describe it is to say: Its like living in literal hell. See I do believe that Hell, demons, and The Devil exist, but they exist right here, they exist WITHIN ME! I understand that many of you may not be able to relate to this Devil that I speak of. In fact I hope most of you CAN’T. But this is for the few in this room who can. The few among us who have faced suicide, who have faced their Devil and have survived. 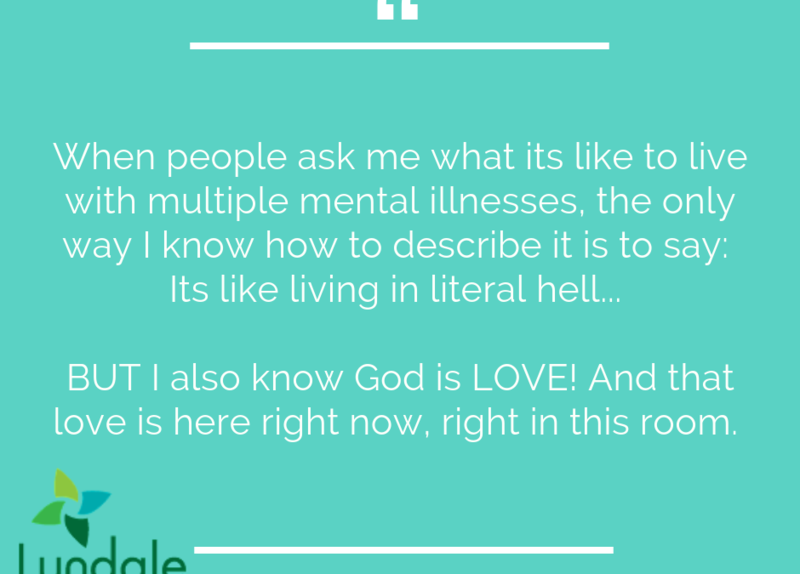 This sermon is also meant to try and explain what it is like to be suicidal, to live with mental illness, and to be on a psych unit for those of us who can’t directly relate to what I am talking about. This sermon is meant to describe a pain that is indescribable. How can I describe spending a total of two months of my life in a locked Psych Unit other than hell? How can I describe attempting suicide 6 times in the last 12 years, other than the Devil that is latched on to my soul bringing me into darkness? And how can I describe what its like to have every emotion and even your logic betray you to the point where you are driven to suicide, other than the demons of my mind dragging me down? It is pure hell to live with survivors guilt knowing that I’ve survived my suicide attempts where so many others have not. Its pure hell to even hate myself over the fact that my attempts failed. Yes, my Lyndale family, I know hell, and I know it all too well! SO…. Now that I’ve thoroughly depressed everyone, Let me quote Gandalf from The Lord Of The Rings and say: “All is not lost”. To go back to the proverb I started out with: “The Devil whispered to the warrior: You shall not survive the coming storm. And the warrior whispered back: I AM THE STORM!” You are that warrior. And I Am That Warrior! Even though I feel so far away from God, that doesn’t mean that God is far away from me. Yes, I’m fighting my demons, and I feel hollow, lonely, and disconnected from my spirituality. BUT I know God is LOVE! And that love is here right now, right in this room. I believe that God is in every living thing, and that we are all part of God. God IS Mother Earth, God IS the rain, God IS my Cats, God IS You, and God IS Me! God IS Our Empathy for one another! God is in Pastors Ashley and Rebecca who not only came to visit me in the hospital but who have been there every step of the way. God is in John-Anthony, and Terri who came to visit me, God is in Allan who called me in the hospital multiple times each week, and God is in Liz who offered to grab coffee and just talk once I was out of the hospital. Finally God is in this community and all of you who offered up prayers to me. I am not saying that we ARE Gods, but instead I am saying that God IS IN the humanity and love that we show for each other! I am IN a storm, the Devil and demons sank my rowboat, the waves are 50 feet high, and I’m tired of swimming against the current! BUT I have survived the hurricanes of my past. And I’ve been left bruised and out of breath on my knees in the surf, but I’ve survived those storms. Before I end, let me clarify what being the storm DOES NOT mean: It doesn’t mean having control over my mental illness, because those waves will get big, and those demons will come back time and time again! Being the storm doesn’t mean, just praying harder and loving Jesus just a little bit more. Being the storm DOESN’T even mean staying out of the hospital for the rest of my life. BUT Being The Storm DOES Mean: That I can look that Devil of Suicide in the face and say NEVER AGAIN, even if I have to back through the hell of a psych unit! For me BEING THE STORM simply means surviving, simply living another day, living through the night to see the sunrise, so I can turn into a lighthouse for those lost in their own storms. When the devil turns to me and says “You will not survive the coming storm” I will turn and look at him with storm clouds in my eyes and say: “I AM THE STORM”! The Storm of Survival! And That Storm will send my demons and devil running! Since I am still learning how to be my own storm, I will not try and tell you how to conquer whatever darkness and pain you are going through. We will all face storms, be it storms of mental illness, or of divorce, or loss of loved ones, or overwhelming debt, or whatever strife you are currently going through. So YOU will have to define what becoming YOUR STORM means to help rise above your darkness. But I not only believe but I KNOW each person in this room can turn into being YOUR OWN STORM of survival! And though I cannot steer your ship, I can be a lighthouse for you. I can help guide you into shore, where the waves aren’t so big. We, this community are all lighthouses for you! So look The Devil in the eyes and say: “I AM THE STORM”! Be The Storm My Friends. BE THE STORM!